Are you thinking about starting a nonprofit, or just want to learn new skills to make your present job easier? Come check out the Craigslist Foundation's Nonprofit Boot Camp on June 20th in Berkeley, CA. The day includes workshops, one-on-one coaching sessions, and keynotes by Arianna Huffington, Randi Zuckerberg and Craig Newmark. The registration fee is $75, but if that's a little steep for you this year, you can attend the event by volunteering for a shift through One Brick. Beth Kanter, my co-Contributing Editor for BlogHer's Social Change and Nonprofit section, and I will both be speaking about how nonprofits can use social media. Beth's session will be, How To Think Like A Social Media Marketing Genius - 8 Principles for Success Inspired by Einstein. My session, which I'll be co-facilitating with Eric Leland of Eric Leland Design, is, Get Started Using Social Media - Today! "That first Boot Camp was an amazing experience for me, and since then I have only missed one. . . .If you work at a non-profit, volunteer, serve on a board, or have always dreamed of starting something that really matters, you should join us . . ."
"The networking opportunities alone are well worth the price of admission, not to mention the excellent speakers and panels." You can listen to sessions from past Boot Camps on the Craigslist Foundation Podcast, and listen to Craig Newmark talk about the event on KPFA's Morning Show with Aimee Allison. Full disclosure: I spoke at Boot Camp last year and have worked on their podcast in years past. Photo credit: Photo of me writing on a flip chart at last year's Boot Camp by Jon Bauer. 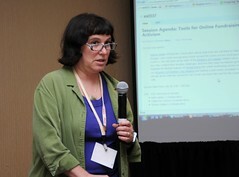 Photo of Beth speaking at the BlogHer Conference last year by JD Lasica. Thanks for the mention, Britt. 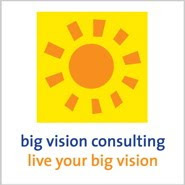 I'm looking forward to your session with Beth Kanter! Funny thing, I just met Beth for the first time last night at the 140Smiles event in SF. She's a fascinating lady with great ideas and focus. Beth - Can't wait to see ya! Anonymous - Thanks for the correction. I always make that mistake. Darius - What a synchronicity!